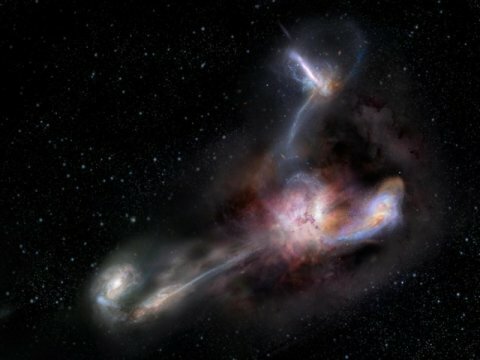 New observations with the Atacama Large Millimeter/submillimeter Array (ALMA) reveal distinct streamers of material being pulled from three smaller galaxies and flowing into the more massive galaxy, which was discovered in 2015 by NASA's space-based Wide-field Infrared Survey Explorer (WISE). It is by no means the largest or most massive galaxy we know of, but it is unrivaled in its brightness, emitting as much infrared light as 350 trillion Suns. The connecting tendrils between the galaxies contain about as much material as the galaxies themselves. ALMA's amazing resolution and sensitivity allowed the researchers to detect these remarkably faint and distant trans-galactic streamers. "We knew from previous data that there were three companion galaxies, but there was no evidence of interactions between these neighbors and the central source," said Tanio Díaz-Santos of the Universidad Diego Portales in Santiago, Chile, lead author of the study. "We weren't looking for cannibalistic behavior and weren't expecting it, but this deep dive with the ALMA observatory makes it very clear." Galactic cannibalism is not uncommon, though this is the most distant galaxy in which such behavior has been observed and the study authors are not aware of any other direct images of a galaxy simultaneously feeding on material from multiple sources at those early cosmic times. The researchers emphasize that the amount of gas being devoured by W2246-0526 is enough to keep it forming stars and feeding its central black hole for hundreds of millions of years. This galaxy's startling luminosity is not due to its individual stars. Rather, its brightness is powered by a tiny, yet fantastically energetic disk of gas that is being superheated as it spirals in on the supermassive black hole. The light from this blazingly bright accretion disk is then absorbed by the surrounding dust, which re-emits the energy as infrared light. This extreme infrared radiation makes this galaxy one of a rare class of quasars known as Hot, Dust-Obscured Galaxies or Hot DOGs. Only about one out of every 3,000 quasars observed by WISE belongs to this class. Much of the dust and gas being siphoned away from the three smaller galaxies is likely being converted into new stars and feeding the larger galaxy's central black hole. This galaxy's gluttony, however, may lead to its self-destruction. Previous research suggests that the energy of the AGN will ultimately jettison much, if not all of the galaxy's star-forming fuel. An earlier work led by co-author Chao-Wei Tsai of UCLA estimates that the black hole at the center of W2246-0526 is about 4 billion times the mass of the Sun. The mass of the black hole directly influences how bright the AGN can become, but -- according to this earlier research -- W2246-0526 is about 3 times more luminous than what should be possible. Solving this apparent contradiction will require additional observations.